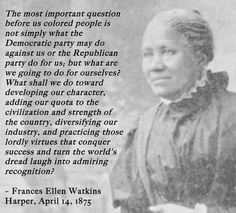 Frances Ellen Watkins Harper spoke the words above in 1866 in a speech titled “We Are All Bound Up Together.” The event was in support of women’s suffrage and led by Elizabeth Cady Stanton and Susan B. Anthony. The latter women were both women of privilege, due to both their pedigree and race. These traits are leading reasons as to why nearly 150 years later black women and white women struggle to have cohesion in the fight for women’s equality. History has shown that while white women might not have had her full rights, they were often supplemented with privileges. American society has always been invested in protecting the sanctity of white women, as seen in the years proceeding Harper’s speech. The 1915 film The Birth of a Nation would become a landmark Hollywood success. Its premise was how the Ku Klux Klan protects white women from the sexual depravity of black men. The aggression is portrayed as being so severe that it is used as a reason to end Reconstruction because the purity of white females is in danger. The Greatest Gatsby, arguably the greatest display of literary Americana, revolves protecting a white woman, even if it is from her own thrills or naïveté. The man who manages to capture Daisy, the female protagonist, is deemed to be most accomplished of the other competing suitors. She is courted with lavish gifts and glowing compliments. Black women have not had images where society is invested in sheltering us. No one tried to shield us because we were not thought weaker but rather because we were deemed unworthy. To further complicate this perception issue, granting all women equal rights would not solve the racial complications. Equality would make white women adequate peers to white men. Black women would not able to say the same about our men. We would still have fathers, brothers, husbands, uncles, and cousins who we desire to have equal footing.